I’ve spent too much of the past week trying to rein in Beltway overreaction, adding in the context necessary to keep my fellow ’12 correspondents from spinning off into the ether. No, Barack Obama did not accuse the Polish people of genocide. No, Bill Clinton’s wandering off the rhetorical reservation is not particularly newsworthy. No, Scott Walker’s win in Wisconsin does not necessarily spell doom for the Democrats. But I’ll abandon that scolding, buzz-killing mode this afternoon to pour some fuel on the latest news of the day—the Republicans’ big fundraising haul. 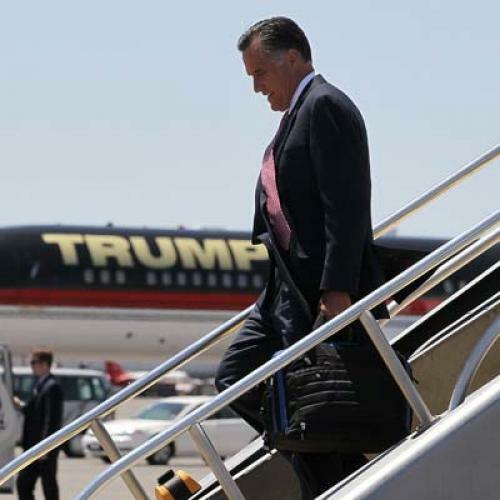 The Mitt Romney campaign and the Republican National Committee announced that they raised $78.6 million combined in May, well more than the roughly $60 million the Obama campaign and Democratic National Committee raised. Now, part of the Republicans’ big take can be attributed to the fact that they are, for the first time, raising money in unison as the Democrats and Obama have been doing for months, something the Republicans couldn’t do while Romney was taking a disconcertingly long time to dispatch a laughably weak primary field. Still, though, there’s no sugarcoating this—the Republicans’ fundraising success is deeply worrisome for the Democrats, because it is of course going to be buttressed by a wave of additional spending by outside groups, led by Karl Rove’s Crossroads groups and Koch Brothers’ Americans For Prosperity. The outside groups are vowing to spend $1 billion total, vastly more than will be spent by unions and other pro-Democratic groups. The Obama campaign knew that the outside wave was coming (thanks, Anthony Kennedy!) but hoped it would be able to stay competitive by out-raising Romney in the conventional, regulated donations, thanks to Obama’s remarkably broad donor base. But that donor base is not producing up to its full potential, and Romney and the RNC, while still not collecting a whole lot from small donors—contributions of $250 or less make up only $12 million of last month’s haul—are raking it in from people able to give the $75,000 maximum. Now, it’s true that there are limits to how much money can buy in a presidential campaign, where the high level of information that most voters already have about the candidates makes it harder for ad blasts to shift perceptions. That said, the difference between what the Romney side will be able to do this time around and what John McCain’s campaign had to settle for last time will be plain to see. McCain, remember, had to pull out of Michigan weeks before the election, over the strenuous objections of Sarah Palin. Whereas this time around, Romney has got outside groups already running ads attacking Obama in Michigan, a nice bit of assistance in a state that Romney would dearly like to compete in but that is, for now, considered safe for Obama by most prognosticators. And lo, after several weeks of the anti-Obama ads, a new poll shows Romney tied in Michigan (to be taken with a grain of salt, like any single poll.) Similarly, Democrats have to fear that the Romney side will be able to launch last-minute pushes with huge ad buys in “reach” states that the Democrats may not have the resources to respond to in time—say, in Pennsylvania—not unlike what Obama managed to pull off last time in, say, Indiana. This is not to mention the huge advantage that the Republican side will have in races down the ticket, where ad buys have more influence—already, outside groups are hammering Senate candidates such as Sherrod Brown, Claire McCaskill and Jon Tester, and House candidates with fewer resources of their own will probably bear the proportionately biggest brunt. I realize it gets tiresome talking about money in politics—there’s only so many ways to say that there’s a ton of it and that it’s going to have a massive impact. It starts to sound sort of Marxist in its materialist determinism. But there it is. It’s not necessarily going to decide everything—the record is replete with outspent candidates who’ve won. But you have to at least keep it close, as the recent mismatch in Wisconsin proved. And the only way the Democrats are going to keep it close is if people—a whole lot of regular people at the small-donor level, and a few key non-regular people at the unregulated, outside-group level--start giving more to ’em. It’s as simple as that. *Addendum: One place that does not need warning on this score is Chicago. John Heilemann's definitive New York cover story on the Obama reelection effort includes much on the campaign finance anxiety haunting Mssrs. Messina, Plouffe and Axelrod.